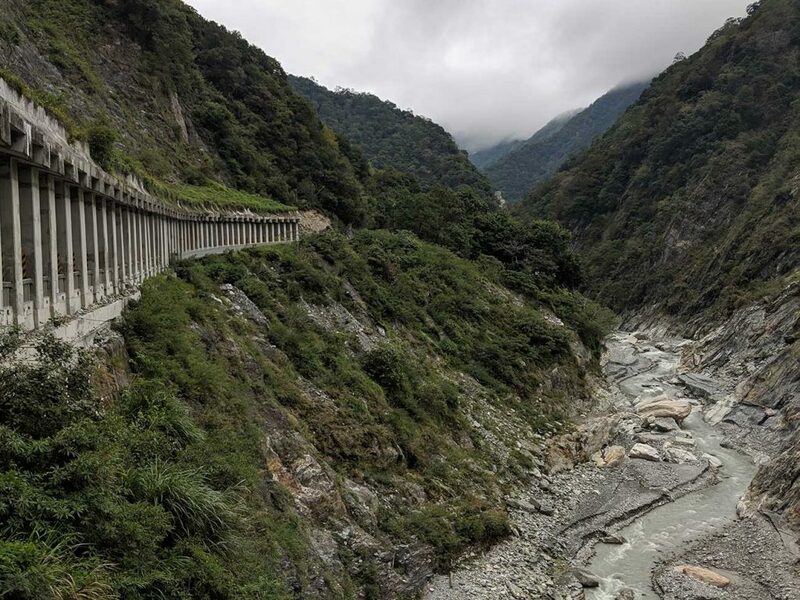 You haven’t seen Taiwan until you’ve seen Taroko Gorge. 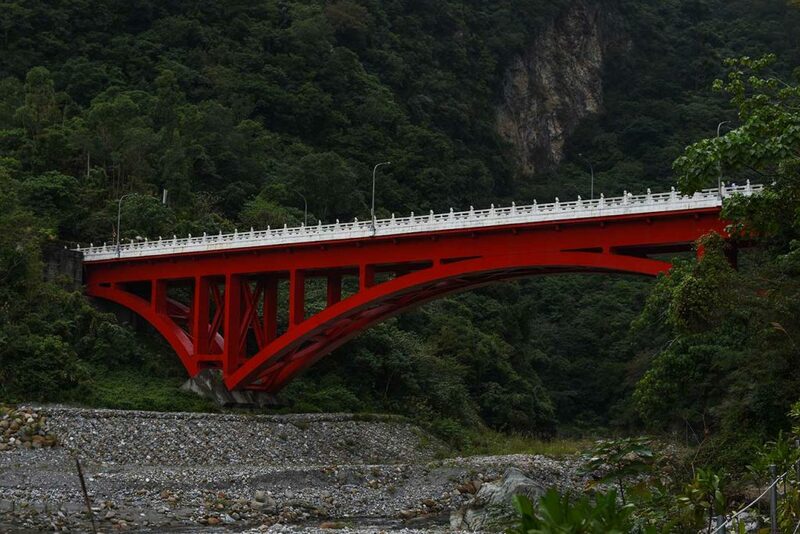 South of Taipei, Taroko National Park sits on the east side of the island. 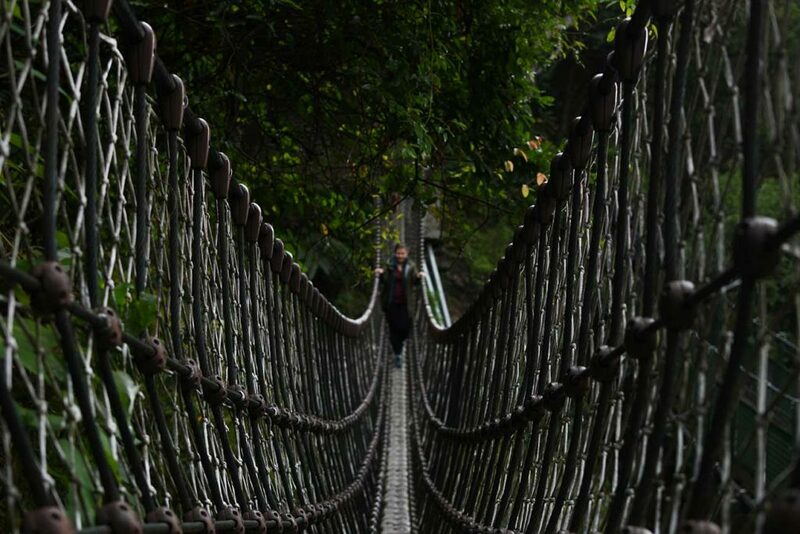 Several hiking trails, waterfalls, glimpses of the coast, and beautiful shrines await you. 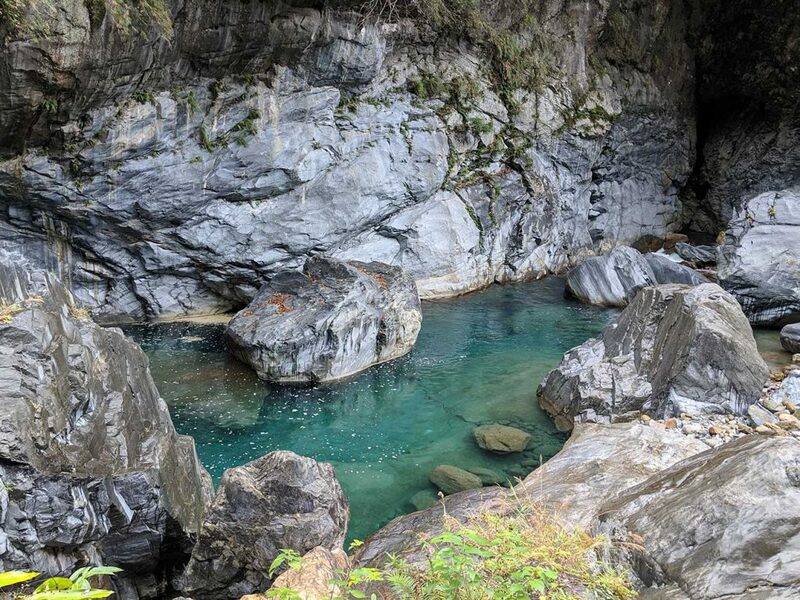 If you find yourself in Taiwan, head to Taroko Gorge and enjoy some nature. You will not be disappointed! We teach English online and at present, our schedules don’t have consecutive days off. 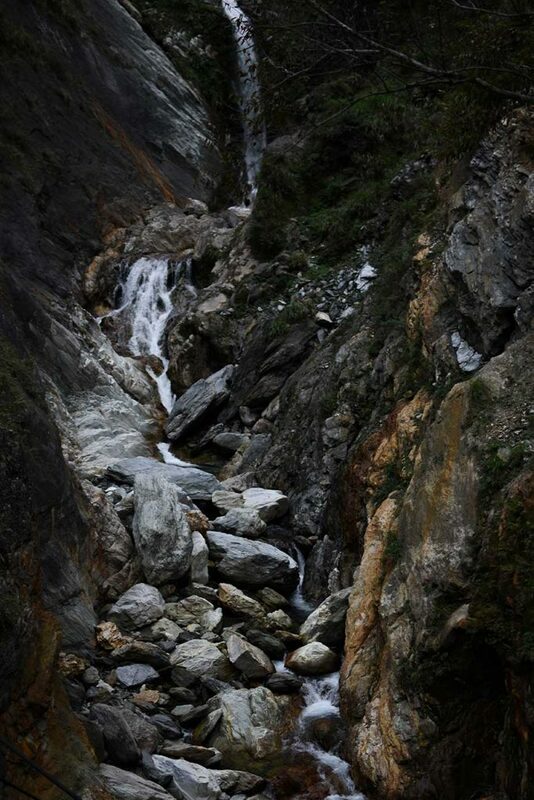 If we had two days to adventure, then we would’ve used two days for Taroko Gorge. However, one day is all you need to see its magnificence. You just have to plan ahead! So let’s talk about the deets. 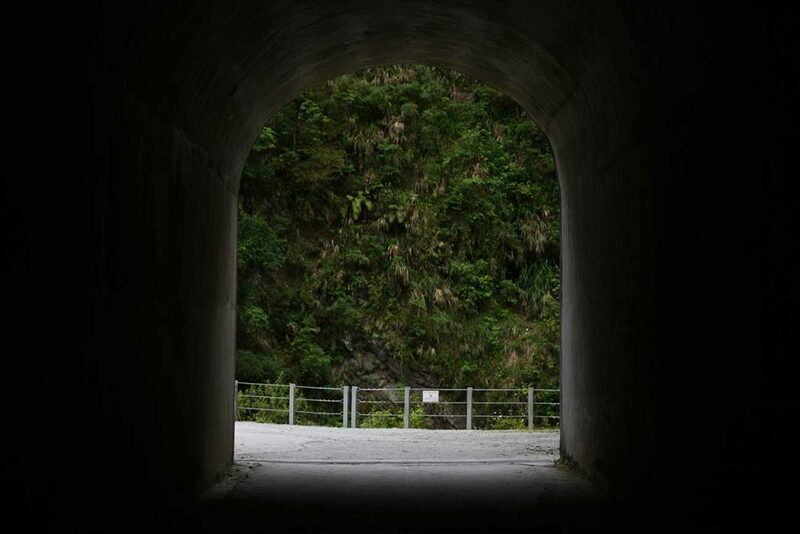 There are a few ways to see Taroko National Park. You could take a tour; we saw many buses going through the park and ran into some tour groups on a few hikes. You could also rent a car. That sounds like fun but the driving in this area is dangerous and the way people drive makes it seem more dangerous. That’s your call! We stayed in Taipei, so to see Taroko Gorge in a day meant an early train ride on the TRA from Taipei Main Station. We purchased tickets online ahead of time. You can do that on Taiwan’s TRA website. 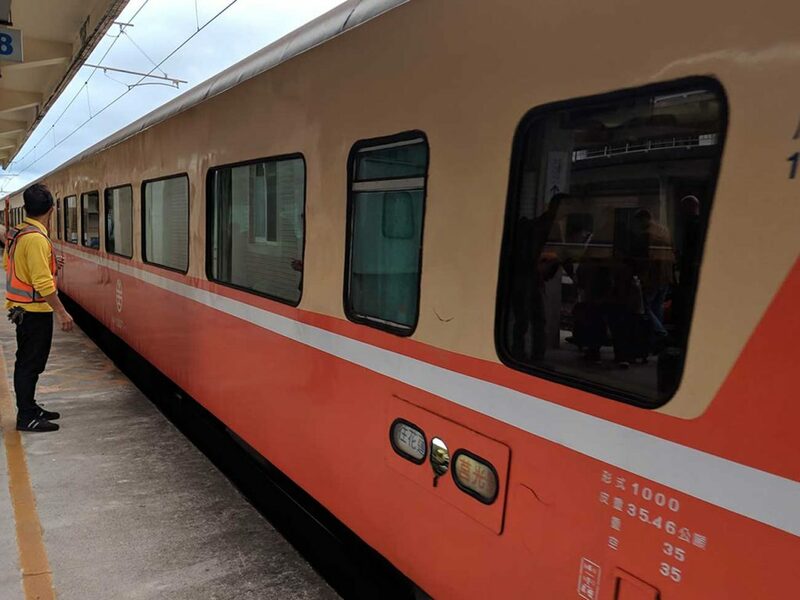 You’ll want to take the train from Taipei Main Station to Xincheng Station. It takes around 2-3 hours, delays pending. Unfortunately, the high speed rail only runs on the west coast. But no worries, you’re in for some great views of the coast on the ride! 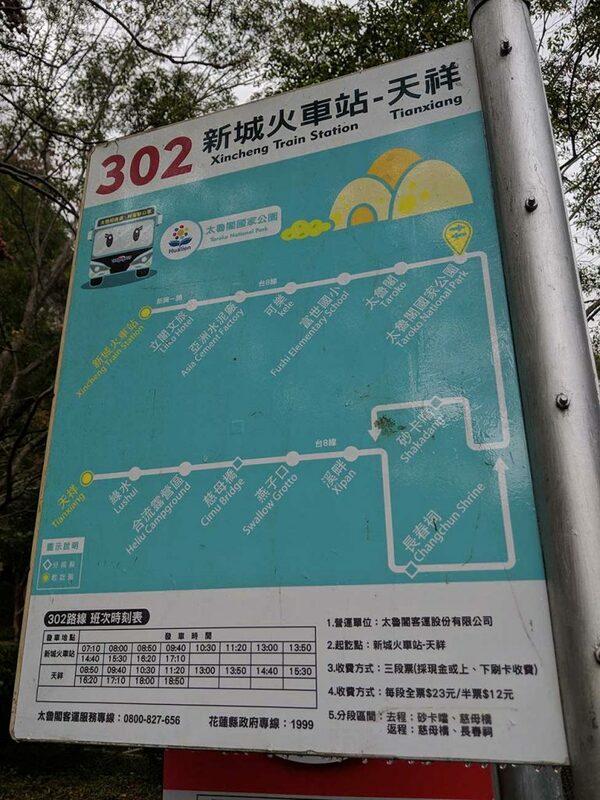 Once you’ve arrived at Xincheng you can take bus 302 to the Taroko National Park Visitor Center. The bus stop is just outside the train station, parallel to the bathrooms. It’s always a good idea to start at the visitor center, as the rangers have tips and you can get that free map! They also give you a handy schedule of the bus times so you don’t get stuck in the park! 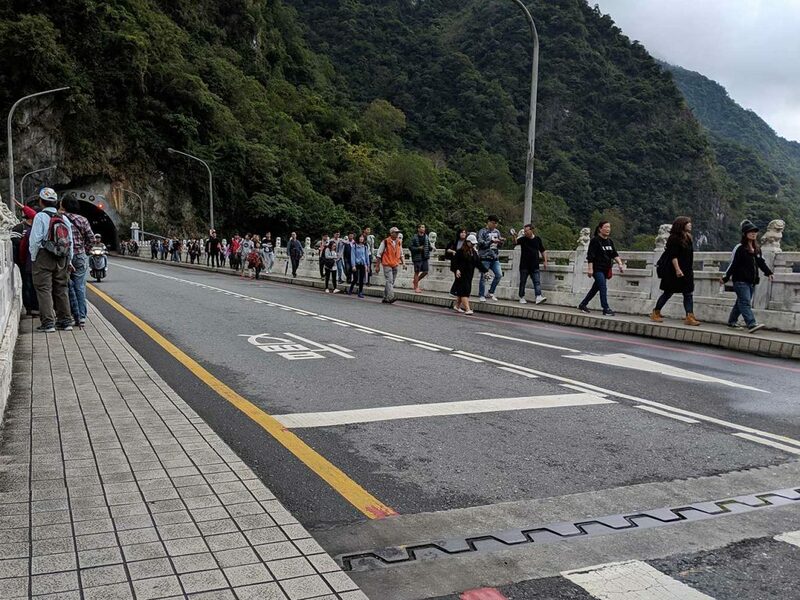 Taroko National Park is huge and if on foot like us, you’re going to take the bus to and fro during the day. Okay, so as we’ve said, this park is huge. Fitting it all in a day is impossible, especially when starting your day from Taipei. There are many trails to choose from, but we highly recommend these. 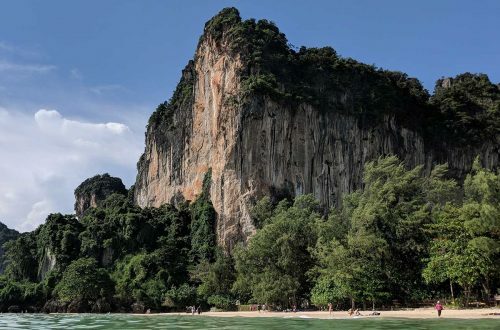 There isn’t much to this short trail, as its main purpose is to take you from the visitor center to the long, winding and awe-inspiring Shakadang Trail. Turn left out of the visitor center towards the road and follow the road to a tunnel. Enter the tunnel and stay on the left side where there’s a lit up walkway. After a ways, the trailhead is on your left. Xiaozhuli Trail offers some cool views of the shoreline in the distance, the town of Xincheng in the foreground. The highlight for us was the short suspension bridge along the way. Taiwan has many of these but this one was a lot of fun. You’ll end this hike right where the Shakadang Trail begins, beneath the red bridge. This trail spans 4.1km (2.5 mi) one way, so about 5 mi round trip. The hiking itself is easy and we went at a slow pace, taking lots of pictures and enjoying it all. The ground is flat for the most part, with the occasional rocky surface. The beginning of this hike was pretty crowded but the further you venture the more peaceful it becomes. And literally, we mean peaceful. The river runs next to you the entire hike, rushing over smooth, colorful rocks, almost like someone painted them. Fans of geology would love this hike. The water is crystal clear and at times becomes a wondrous turquoise color. The river is fascinating but there are also the lush mountains that surround you. The weather, in mid-December, was overcast and rainy at times, which was perfect! The mountains were mysterious, the clouds hovering over their peaks and traipsing slowly across the sky. We couldn’t have asked for a better day. Having been in Southeast Asia since August, we never experienced the fall season. 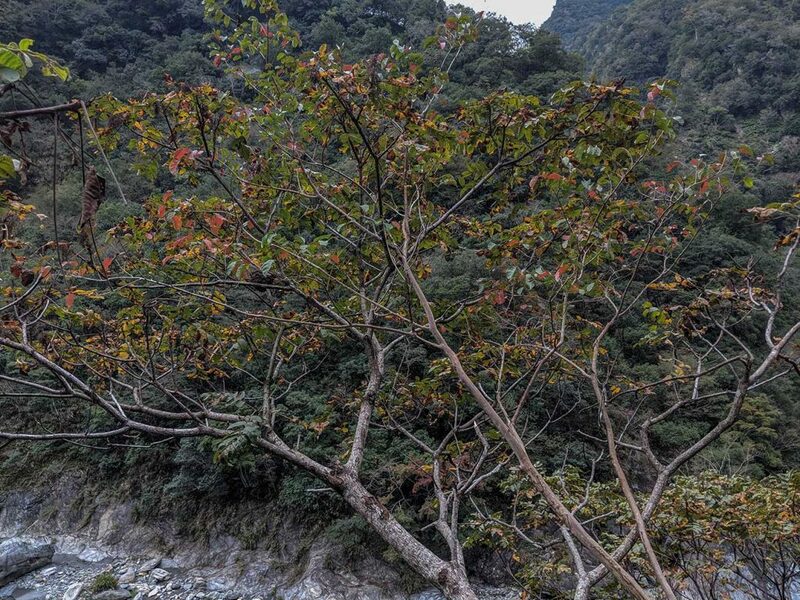 Taroko National Park houses some trees that change colors so that was a nice surprise! By “some trees”, we mean very few. But hey, we’ll take it. You’ll find some grub in a hut around the halfway point of this hike. They sell tea and some sausages, as well as some things we don’t know. 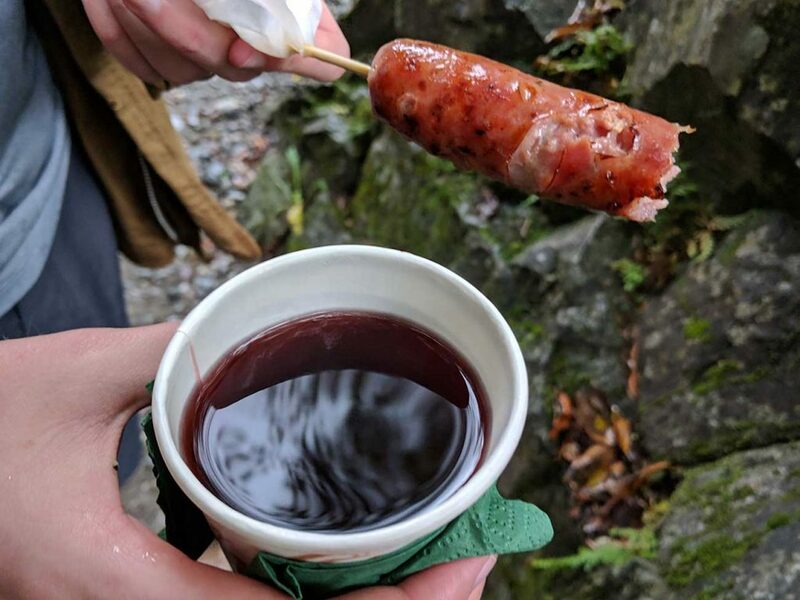 We tried the tea and sausages and they were so good! We packed food for our day, of course, but this was a nice treat. Only $3 USD! You’ll return to the red bridge and then take the stairs up to the road. There are some more great views here and at the opposite end of the bridge you’ll find a restroom and the bus stop for 302! Onward! This trail, around 2km (1.2 mi) one way, is all about waterfalls! And tunnels. Lots of tunnels. You’ll need a flashlight, as it gets completely dark at times. We just used our phones as flashlights. It’s fun to dare yourself to go as long as you can without one ( we made it maybe 10 seconds). The trail advises wearing a hardhat, due to falling rocks. A few people were sporting the head protection but most did not. Just be careful! It’s a little tricky. We were definitely questioning where we were going. You take bus 302 from the bridge at Shakadang to Tianxiang, a quaint little town with some restaurants, a 7-11, and an awesome view of a statue overlooking a bridge. Keep going past the 7-11, following the road. You’ll be going uphill and the road will curve. It takes a little time (less than 10 minutes) but you’ll get there! You’ll eventually see a cool looking tunnel over the highway. Take care here as there is no sidewalk and many motorcycles are flying around the curves! The trailhead is on the left side of the road, just a short walk within the tunnel. And lo and behold, you begin the trail in a tunnel. It’s a long one. You then follow an easy path next to the river, eventually coming to gorgeous rapids and waterfalls. This was a great spot for pictures! We really took our time here and soaked it all in, not wanting to leave. You’ll see another tunnel at the end of this trail. Take it! It leads you on a short walk to the “Water Curtain”. There are free ponchos sitting beside the entrance so be sure to grab one. Take the rock path over the water and enter another tunnel. Just a few steps and you’ll see water violently rushing out of the rock ceiling. It’s very loud, but very cool! There were people hanging around inside, trying to get a picture. There’s really not a lot of room in there unless you want to stand in high water. We got our quick view and headed back to Tianxiang. This hike was beautiful! Our train back to Taipei from Xincheng was at 7:50 pm. We returned to Tianxiang around 5 and wanted to catch the 6 o’clock bus back to the train station. It’s a 50 minute ride back down to Xincheng. You don’t want to miss the last bus out of town! 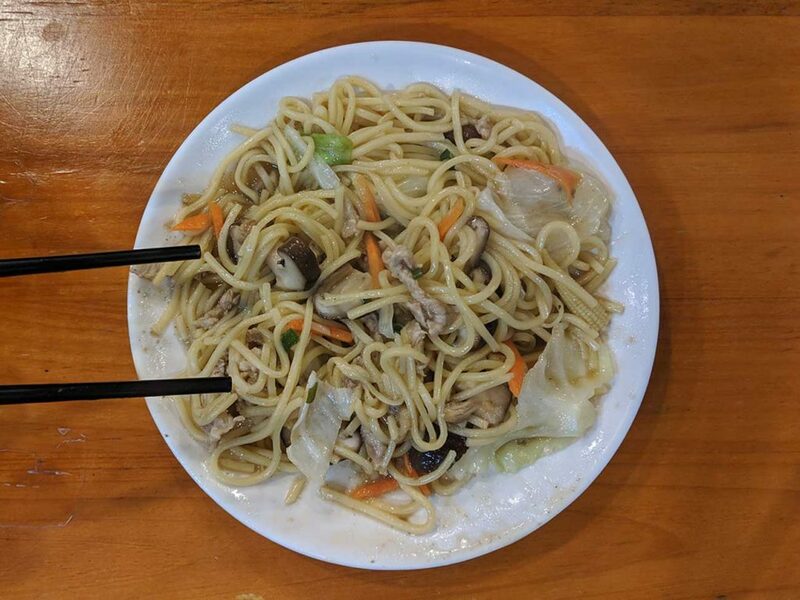 So we hung around Tianxiang for a bit, eating some dumplings and pork noodles. There’s a great restaurant next to the bus stop. The perfect place to end the day. We wish we could’ve hiked the other trails and seen it all. It would’ve been nice to have our own car as well. But we had one day and made the most of it. It was absolutely worth it. 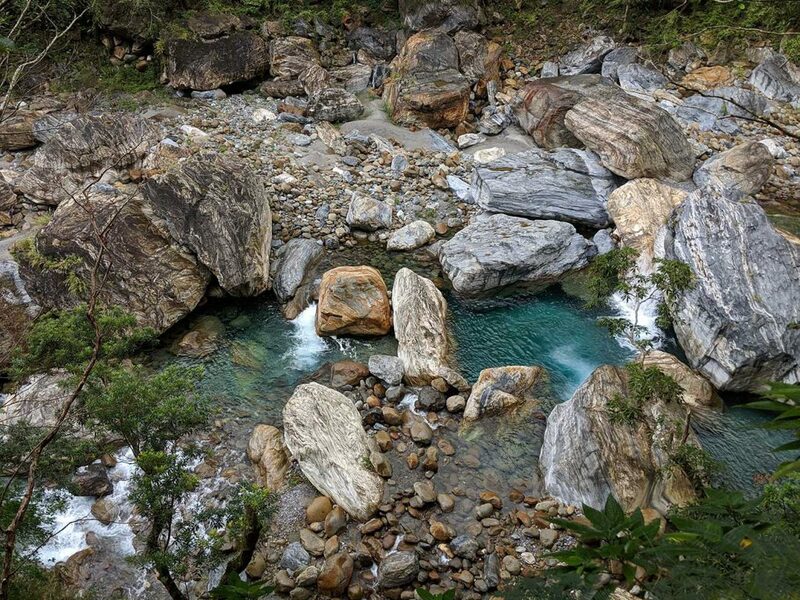 Taroko National Park is a must-see in Taiwan. We hope you get to experience it. 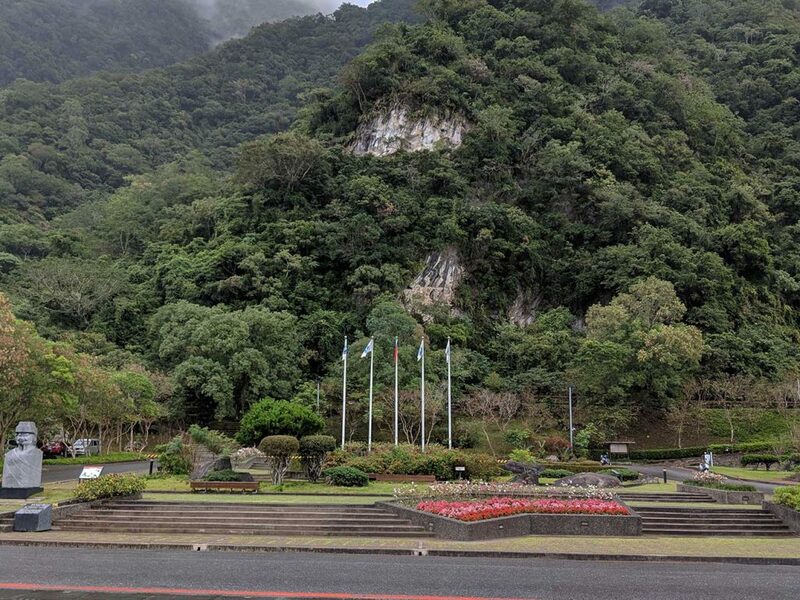 I didn’t realize Taiwan had such a beautiful national park! Too bad your schedules limit the number of days you have off. I love using public transportation when I travel too. It might take longer to get where we’re going, but it’s so much cheaper, and more interesting. Those are some gorgeous pictures you took. 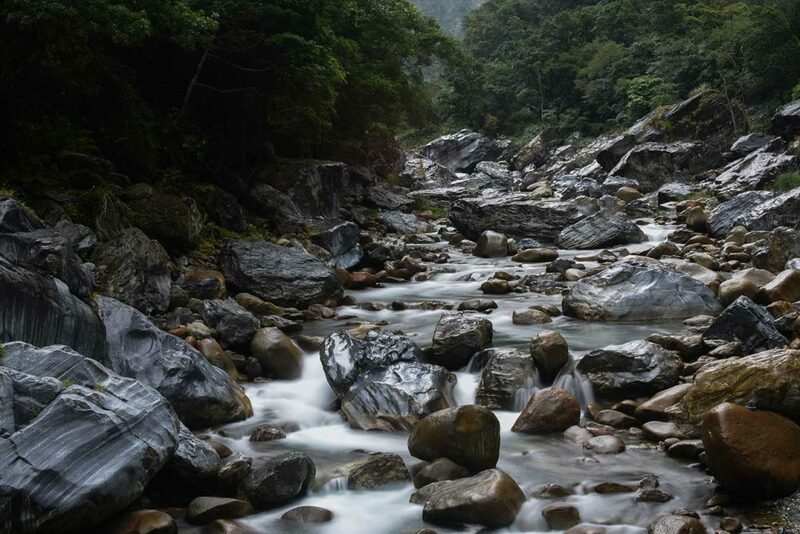 Yes, Taiwan is full of national parks! Unfortunately we were unable to see them all but we hope to return! Public transportation is the way to go! Thanks for sharing. Taroko National Park in Taiwan looks awesome! I’m heading out that way next fall! I’ll definitely be sneaking in a couple of great outdoor adventures. Thank you for sharing. How exciting! We miss Taiwan already. Hope you get to visit Taroko! Great trip descriptions and advice for anyone wanting to experience the park themselves. The water pouring out of the ceiling sounds very very cool. 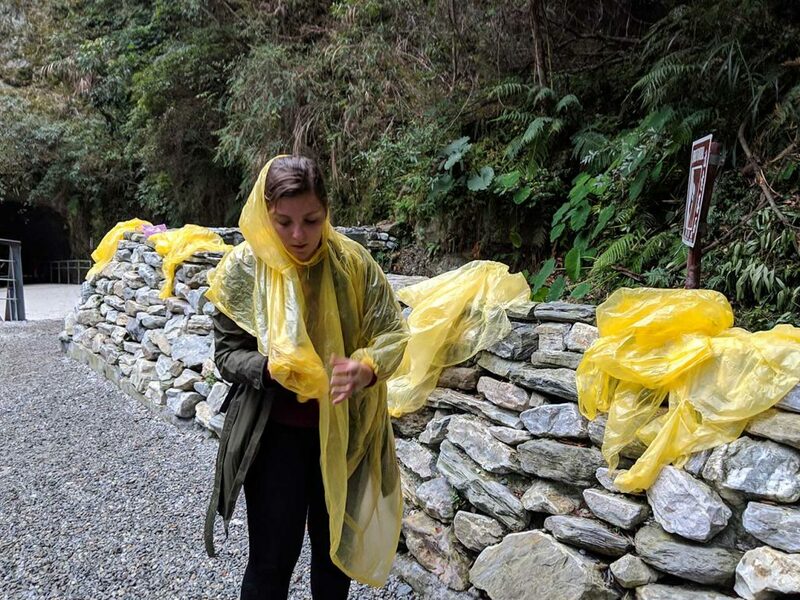 Were the free ponchos totally wet inside and out … or were they in pretty good shape? Thanks for the comment, Michael. The ponchos were actually in really good condition! We didn’t even see them until a kind girl told us to grab one before entering. It’s a good thing she did haha. Fantastic photos which inspired me to want to see it in person! Such a detailed account with great tips which is super helpful for anyone who wants to travel there. So glad it inspired you! That’s our goal. Thanks for your comment! Taroko National Park really looks beautiful place in Taiwan which is worth visiting. That red bridge is wonderful and also the nature trail beneath this bridge. It’s worth it! And yes, the red bridge really stood out against the green. The overcast day really brought out the colors. Very cool! At first when I saw the title I thought it had something to do with my favorite Japanese food tarako. Clearly, it had nothing to do with it 🙂 Looks like a great day in nature and that bridge looks incredible. Haha no, not quite Japanese food. Just hiking and nature. It was a great day! Thanks for commenting. Wow, striking greenery and majestic views of the Taroko NP are so inviting. And that suspension bridge is phenomenal! Hope to visit the park and Taiwan someday. What would be the best season for visiting Taiwan and the park? We hope you can too! The best time would probably be the fall or early spring. The summer in Taiwan is so humid and hot so you’d be drenched in sweat. Honestly, our December trip was perfect so we definitely recommend that time of year. I had no idea that Taiwan had such beautiful places!! This sounds like a great escape from the city for a day. I’d love to do the hikes, especially the one with the tunnels and waterfalls! 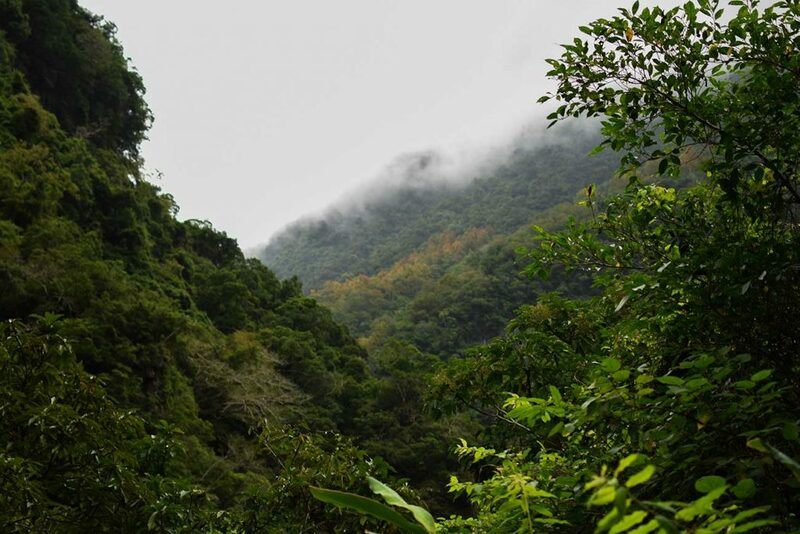 Yes, Taiwan seems really small but it truly has some wonderful nature. Taipei is a really cool city, but Taiwan is best seen through its countryside. I have never been to Taiwan so read this with great fascination. 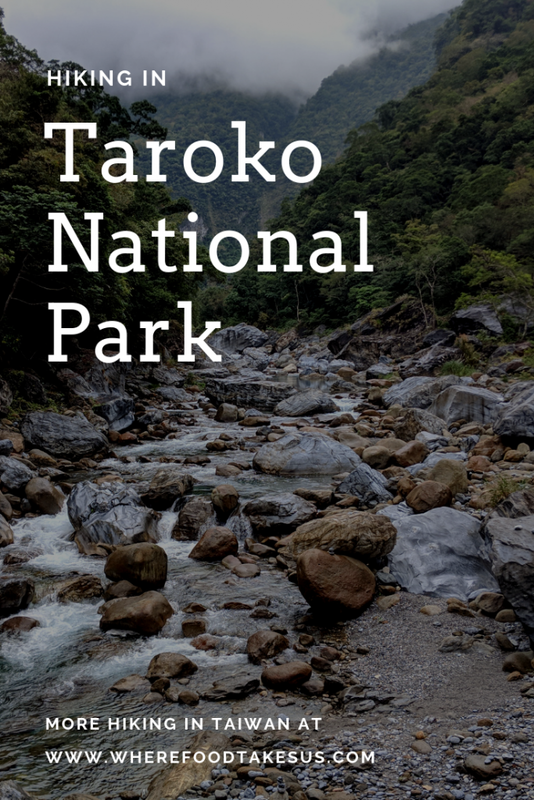 Taroko National Park looks amazing and I also would want to experience it independently. If you went for 2 days, is there somewhere close by to stay overnight? Xincheng? We hope you get to! Xincheng is an option for accommodation but you might be better off in Hualien, which is just south of Xincheng. That way you could see more of the east coast as well, which is beautiful! Wow, what a great nature! Your pictures really make you want to explore the area. Was it very crowded there? Or could you enjoy the peace and quiet? I would very well imagine traveling there. We hope you get to explore it! There were tour groups but they don’t do much of the hiking, they go from stop to stop to take pictures. You can find lots of peace and quiet on the trails. Probably helps that we visited in December.